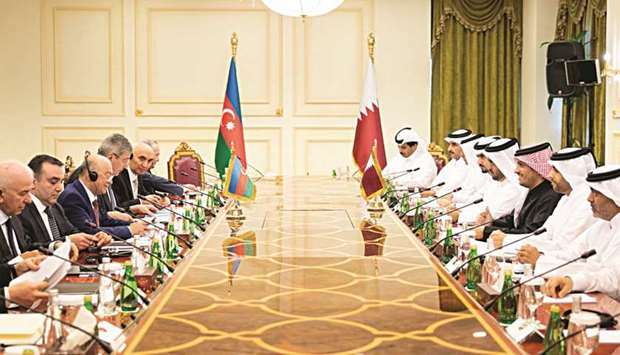 The Qatar-Azerbaijan joint intergovernmental trade-economic and technical committee held its second meeting here yesterday, reflecting the two countries’ commitment to further develop bilateral relations. The meeting was chaired by HE the Deputy Prime Minister and Minister of Foreign Affairs Sheikh Mohamed bin Abdulrahman al-Thani, and Azerbaijan’s Minister of Emergency Situations Kamaladdin Heydarov. HE Sheikh Mohamed bin Abdulrahman al-Thani highlighted the positive outcomes of the committee’s first meeting in terms of enhancing bilateral ties. He noted that the current year coincides with the 25th anniversary of establishment of diplomatic ties between Qatar and Azerbaijan. He said that the visit of His Highness the Amir Sheikh Tamim bin Hamad al-Thani to Azerbaijan in 2016, and the visit of Azerbaijan’s President Ilham Aliyev to Qatar in 2017 contributed to enhancing bilateral relations. HE Sheikh Mohamed bin Abdulrahman al-Thani praised Azerbaijan’s active participation in the International Products Exhibition and Conference (IPEC), which took place in Doha last October. For his part, Azerbaijan’s minister of emergency situations praised the development in bilateral ties. He highlighted the role of high-level visits in enhancing them, noting that during the visits several bilateral agreements were signed. The minister added that both countries’ companies also contributed to increasing trade and opening up further scope for co-operation. The meeting focused on enhancing trade volume and exchanging visits between delegations, chambers of commerce, businessmen, and the private sector, in addition to organizing joint trade events for Small and Medium Enterprises. The meeting’s minutes were signed on the occasion. The first session of the Committee was held in Baku on 31 January, 2017. It witnessed many achievements, the most important of which was to contribute to the success of the visit of the President of Azerbaijan to Qatar, in addition to visa exemption for nationals of both countries, and the resulting increase in the number of tourists visiting the two countries, the strengthening of co-operation in cultural and education fields, as well as increasing trade volume. The committee was established as part of an agreement signed between the governments of Qatar and Azerbaijan that was signed in Baku on March 8 of 2016.